Hugo Trevino has gone to MDA Care Centers and attended MDA Summer Camp since he was a child. 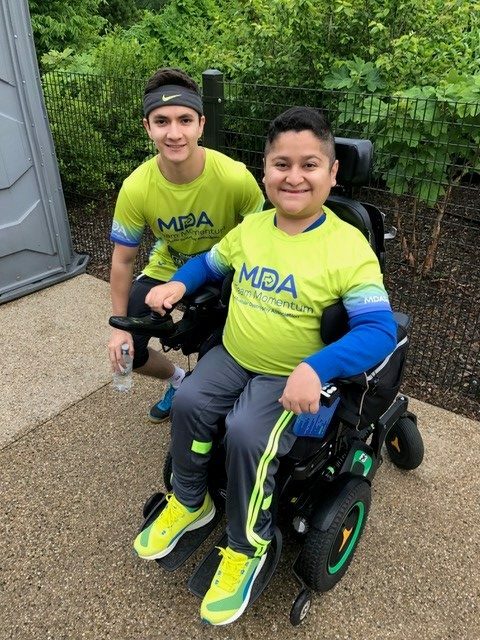 Now as an adult, Hugo works at MDA as a resource specialist, assisting MDA families with any questions or concerns they may have. Hugo is currently pursuing a master’s degree in international higher education. My sister Maria and I have always been close. We are the two middle children of my family, we studied abroad together in Costa Rica and we constantly make each other laugh. While we love hanging out I never would have imagined that we would have participated in an endurance race together. That is until MDA Team Momentum came along. It all began when I decided to go to a Team Momentum Inspiration Dinner last fall to show some support for my wonderful coworker April Tunniclif, the Senior National Manager of MDA Team Momentum. Even though I cannot physically play sports, I love watching events like the Olympics or American Ninja Warrior and cheering on athletes as they push their bodies beyond the limits and achieve incredible goals. People who run marathons and other endurance events are so inspirational to me because they are everyday people who decide to push themselves to greater heights. I decided to invite my sister to the Inspiration Dinner knowing we would get to meet amazing families who were standing up against muscular dystrophy, ALS and related life-threatening diseases and fighting back to find a cure. Listening to people talk about why they are using their muscles to find a cure and to give strength to those who have none turned my sister and me into crying messes. But we were also inspired. My sister turned to me and said she needed to fight back as well. She decided to run for me and my sister, who also lives with spinal muscular atrophy (SMA). Having her join Team Momentum was a dream come true but we did not realize everything that was yet to come. By the time we left the MDA Team Momentum Inspiration Dinner, my sister was signed up to run in the Chicago Spring Half & 10K. We jokingly began talking about how cool it would be if she could also push me during the race — but we did not think it would come to fruition. When I mentioned it to April, she said we should go for it. So we did. We began searching for the best possible running wheelchair, trying to discover what would be the best fit. Unfortunately, all the running wheelchairs we found online were $3,000 – 4,000. We played with the idea of creating a GoFundMe account, but I was facing other financial constraints with needing a new wheelchair-accessible van and also paying tuition for my Master’s in Education degree. Right before giving up on finding a running chair, we got an email from one of the most inspirational people I know, Chris Benyo. 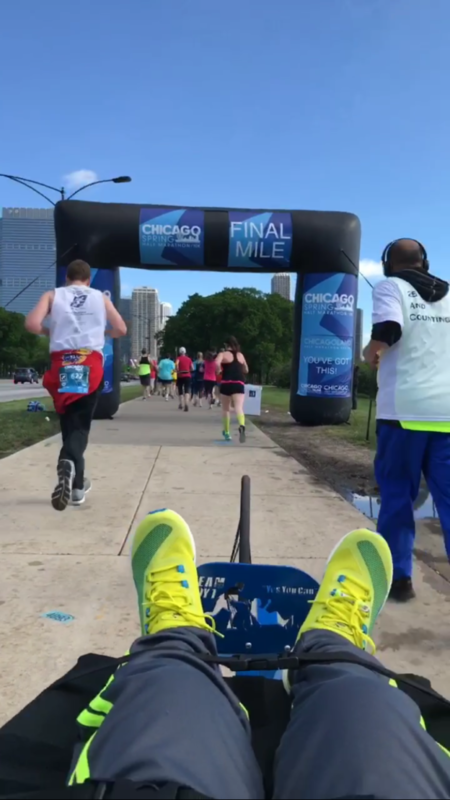 I remember seeing Chris run in honor of his late wife Denise, who died from ALS, pushing her running wheelchair with a picture of her in the Chicago Marathon last fall. He was actually the inspiration behind the idea we had for Maria to push me, so it was incredible that he was there to help us realize our dream. In lending us her chair, Chris allowed us to do our part in keeping Denise’s memory alive. I am extremely grateful and thankful to Chris for his trust and generosity. Raising the money for the race was the probably the easiest part of being on Team Momentum. Once the word got out, the money was raised in about two to three weeks. (We are already planning to run and fund raise again to beat this year’s total.) 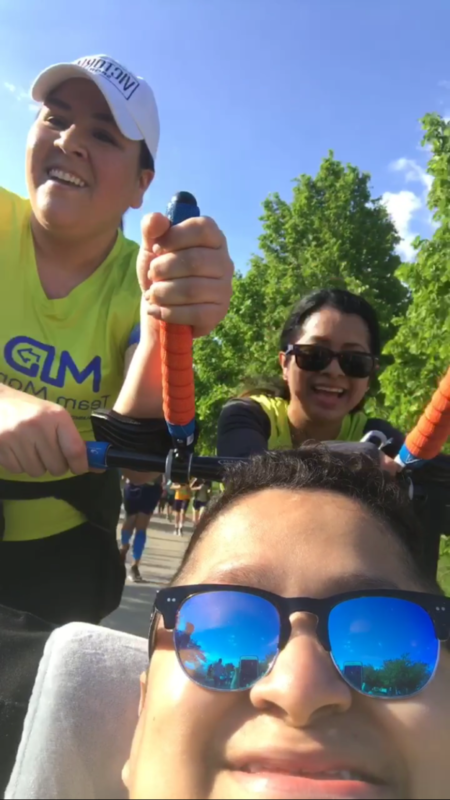 We talked to all of our friends about the event and managed to convince our childhood friend, Yasmine Ocon, to run with us. Without her help, the race would have not have been possible either. My sister suffered an injury about a month before the race and we were honestly afraid we’d have to bail out so close to the finish line. But after a short recovery, my sister decided to get back out there. Her first run back was two and a half miles with me in the chair. At first, she was afraid to push the chair but it actually gave her more stability as she was able to lean her weight into the chair for support. She ran about two to three miles every day before the race. Ev en though we are already super close, life happens and sometimes we can go a while without really talking. This event brought us even closer together, if that is possible, and made us constantly check in on each other. I would ask her about her runs or she would ask me if I wanted to join her on a run — something I was never able to do in the past. It was really nice being able to spend time with my sister in a hobby that I had previously categorized as only available to able-bodied people. Event day was surreal! I woke up at 4 a.m. and began getting ready. I was so excited that I even bought my very first pair of running shoes (I felt silly doing it but I had to look the part). We took a train into the city and it was so cool to have people stare at an empty running wheelchair instead of me for once. As we reached Maggie Daley Park, I had to take separate sidewalks as some accessible paths were blocked off, which made navigating the park a little challenging — but at that point taking longer routes wasn’t going to stop me. 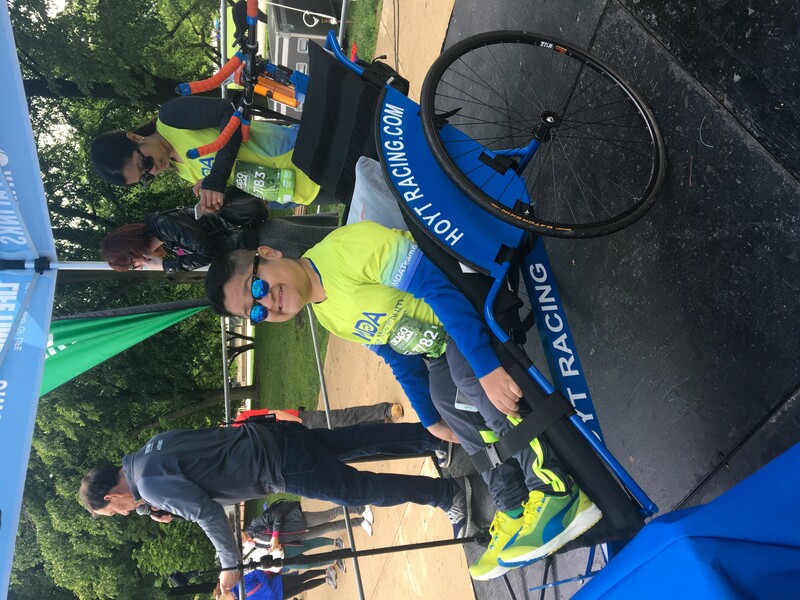 As we arrived, we checked into the MDA Team Momentum tent and I transferred into my running wheelchair. I was quickly escorted to the front of the 10k starting line where I proceeded to give a send off speech to all the 10k runners. That made the event even more real for me — I was no longer just a speaker but a fellow runner. I was on a high the entire race! My senses were on overload. I kept screaming and cheering on my sister, friends and other runners. I did not know where to look or how to feel and was trying to take pictures while also taking in the experience and living in the moment. My sister and her friend were the perfect tag team as they switched off pushing me. It seemed seamless and thankfully neither one overly exerted themselves. Each mile marker gave my sister and my friend a boost of energy. Going through the finish line was the most exhilarating part of the race. My sister and her friend held hands as they crossed the finish line and each had one hand on my wheelchair. We passed the finish line with one final sprint of energy. The best part was that we were greeted by my mom, my sister who also has SMA and my adorable niece. This experience was unforgettable and something I will always speak fondly about. Crossing that finish line showed me that as long as I have the support of family and friends, I can do anything. It takes a village! I physically do not have the strength to lift anything more than 3 pounds. My sister and friend, who are already role models of mine, became my heroes as they gave me the experience of running an endurance race, something I never thought was possible. 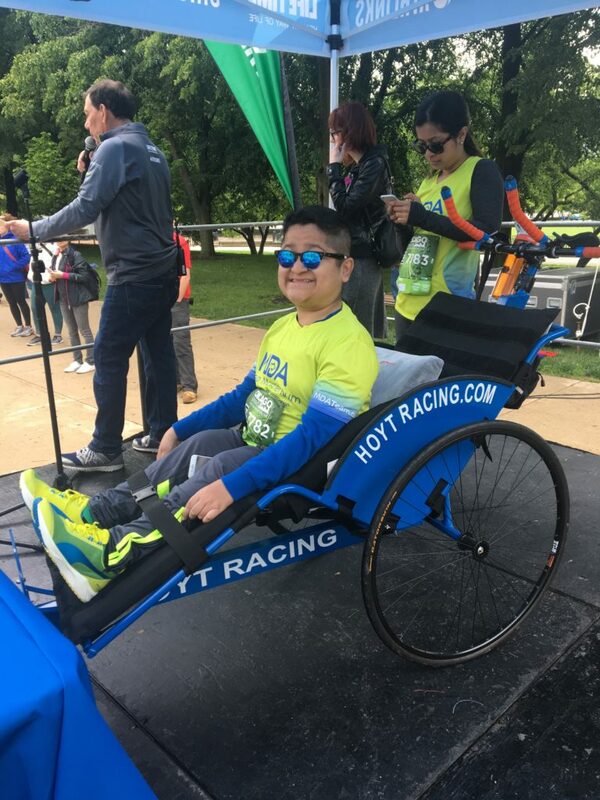 By running this race they are contributing to the hope that one day no other family will have to be affected by a muscle disease such as SMA. I am so grateful for them. I hope they know what this race means to our family, the SMA community and the entire community of people with disabilities. Their muscles ran a 10K but their strength is inspiring me to never give up in life no matter the distance. 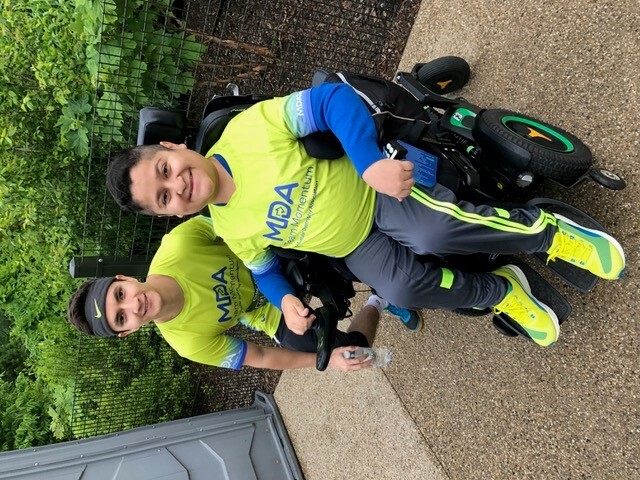 Join MDA Team Momentum for the 2017 Bank of America Chicago Marathon!